As blogged previously, I had looked a bit into the historic roots of Vienna lager, a beer style that was quite successful in the 19th century in Europe, but has since then been forgotten in its country of origin, and had only been revived through the US craft beer movement. 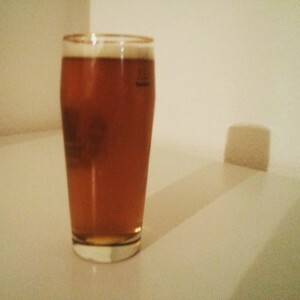 In April, I finally managed to brew the beer, and it fermented and matured in the weeks afterwards. It’s been lagering for a while, but a few weeks ago, it was finally ready and also finished carbonating (I had kegged the beer and force-carbonated it). The end result is a good, quaffable lager at 5% ABV, though a bit rough around the edges. What I do like about the beer is that it just puts the intense maltiness of Vienna malt in the foreground, accentuated by a bit of residual sweetness due to a very poorly attenuating yeast. What I don’t like so much about it is how the hops play together with this residual sweetness: even though I only used Saaz hops as the sole hop addition for bittering, the beer got a very spicy hop flavour. That would be great in a dryer beer, but with 4°P final gravity, it’s just a tad too sweet, and that just clashes a bit. Don’t get me wrong, it’s still a good beer, and I’ll happily drink it, but the next one I’d do differently. Definitely a better attenuating lager yeast, and maybe a different hop variety. I think I really need to research Austrian 19th century hops wrt. to what Anton Dreher used in his beers. As mentioned in one of my previous articles, it’s very unfortunate that Austrian hop land races were (presumably) lost either due to illnesses (which ultimately brought us Styrian Goldings) or a forced stop of any hop-growing activities by the Nazis (as it happened in Mühlviertel, Upper Austria). Another lesson that I learned was that the WLP820 yeast strain, at least in its first fermentation, is extremely slow. I even employed a quick lagering schedule with which I had had success in previous beers, but it still took 3 weeks until fermentation completely stopped. At least it behaved pretty much as expected, and was only a tiny bit more attenuative than its historic predecessor. Starting at 13°P original gravity, it fermented down to 4°P, while brewing records show something closer to 4.5°P to have been the beer’s final gravity. That’s fine with me, really. All in all, it was definitely an interesting exercise, with a tasty outcome, and I really learned what works and (more importantly!) what doesn’t with Vienna lagers. About a month ago, I posted about some things I found out about Vienna lagers, and how the historic original probably was like compared to modern versions of that style. So yesterday, we finally got around to brewing it on my own. I compromised a bit in the whole process, though, just to make a few things a bit easier for me. In particular, I decided not to do a decoction mash. I use a Weck preserving cooker as a mash tun, as it can contain plenty of liquid for the mash, and it’s electrically heatable, allowing to go through specific rest temperatures without having to resort to having to add hot water later. Just don’t trust the internal thermostat, and use a proper food thermometer instead. For modern malts and a high degree of diastatic base malts (like 100% in this case), that’s good enough to fully convert all starches. After an iodine test showed that all starches were indeed converted, we continued with lautering. For that, we use a simple bucket from my preferred homebrewing online store, with a Mattmill false bottom. For sparging, we always employ a colander with a food container lid set in the middle, to sprinkle hot water on the mash. BTW, my hot water is… my boiler. My flat contains a large boiler that actually delivers 80 °C hot water. Perfect for sparging. Anyway, we boiled it for 90 minutes, with 60 grams of Saaz hops for bittering, and no other hop addition. After a whirlpool, I moved the wort to a fermentation bucket, and cooled it down to 20 °C with an immersion chiller, then moved it to my keezer to further cool it to 11 °C. The hydrometer showed a bit more than 13 °P as original gravity, while the refractometer showed 14 Brix. A recalibration really seems necessary. Finally, in the evening, I pitched a starter of WLP820 yeast. That should give a low attenuation comparable to the lager yeast that was used in the 19th century in Anton Dreher’s brewery. The beer is going to ferment in the next two weeks or so. I’ll use Brülosopher’s quick lagering method, as I’ve had some good experience with it in previous batches of lager brewing. As soon as the beer is finished lagering and carbonating, I’ll post a report about the final result.